These days you can’t just build a website and expect people to find you. There are literally billions of webpages on the internet and competition is fierce. If you’re to stand any chance of attracting organic traffic you need to be constantly evaluating and improving your site. If you own a site for the purpose of selling your products then you have the added stress of converting your audience. But did you know that an ecommerce SEO audit can help with both? Today we’re going to show you how to audit your ecommerce site to improve not only organic traffic and rankings but also conversions. After all, that’s surely what you’re here for, right? 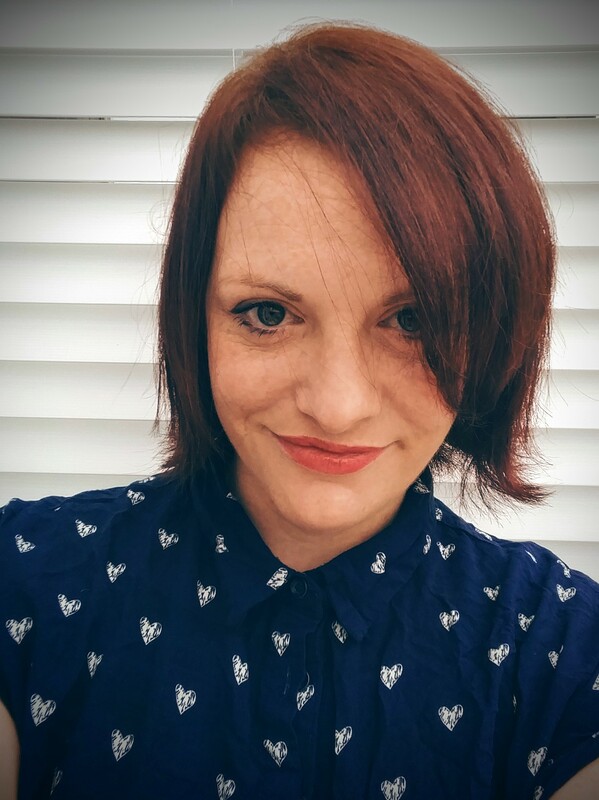 Why do I Need an Ecommerce SEO Audit? Did you know that one in four of us shop online at least once a week? With worldwide online sales estimated to reach around $2489 trillion by 2018 online retailing is not only growing in popularity - it really is a big business, with big competition. The difficulty for many ecommerce sites is that you’ll be competing with online giants like Amazon and eBay. If you’re going to stand any chance of appearing on page 1 on Google then you’ll need to develop a strong ecommerce SEO strategy and this can only be developed once you have a good understanding of what elements on your site need improving. Google examines sites in order to make a decision about where they should appear in its result pages. The elements that it examines are called ranking signals and there are over 200 of them. The best way of identifying and improving these ‘signals’ is by performing an ecommerce SEO audit. Comprehensive audits like WooRank will assess the most significant of these ranking signals to identify where your site can improve. Putting these things right will increase your chances of ranking highly in SERPs and will help increase organic traffic to your site. Check out this Ultimate Guide to Ecommerce SEO to learn why SEO is critical for Ecommerce success. How to do an SEO Audit on an ecommerce site. Doing an SEO audit on an ecommerce site is no different to any other site audit and it’s important to understand that improving all SEO elements will help to achieve greater rank and conversions. However, there are elements that will have a greater impact on ecommerce sites so we’ll be going into more detail about these along the way. The first step is to use a tool like WooRank to get a good understanding of how your site performs overall and aspects require improvement or urgent attention. So let’s take a look at the results in bit more detail. 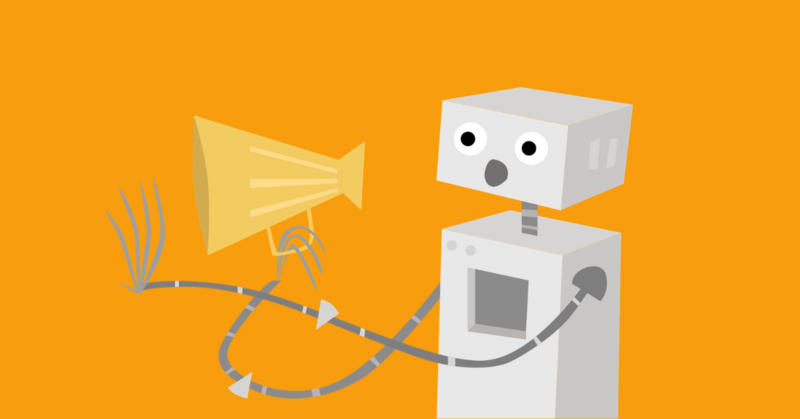 Use the tool to see if your site has a robots.txt and XML sitemap. This is vital to helping search bots find, crawl and index your site. Check how many pages have been discovered. If the number here is much less than you’d expect, then your pages aren’t being indexed by Google and won’t be showing up in SERPs. Use the SEO crawler to crawl of your entire site and diagnose any problems that could be hindering your site from being crawled and indexed. Links between pages and broken links are also identified here. Since broken links are bad for the user experience you’ll want to address these by using a tool like Check My Links (Chrome extension) throughout your site. In this section, you can also check if your site is resolving to your preferred domain. 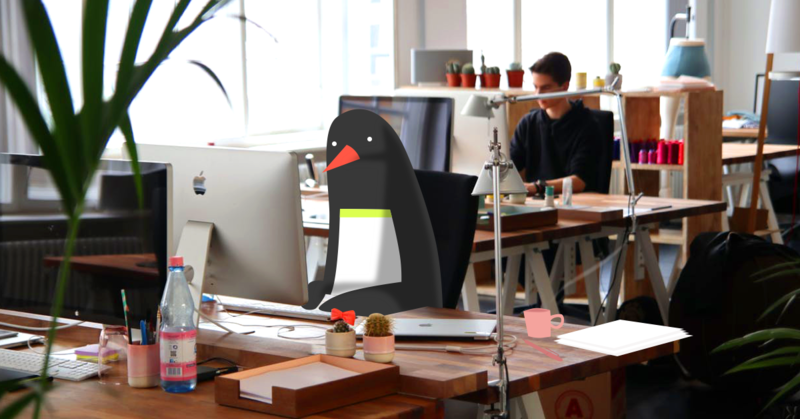 If it doesn’t Google will see all instances of your site as duplicate data which will have a detrimental impact on your site’s ability to rank. (We’ll talk more about duplicate content later on). 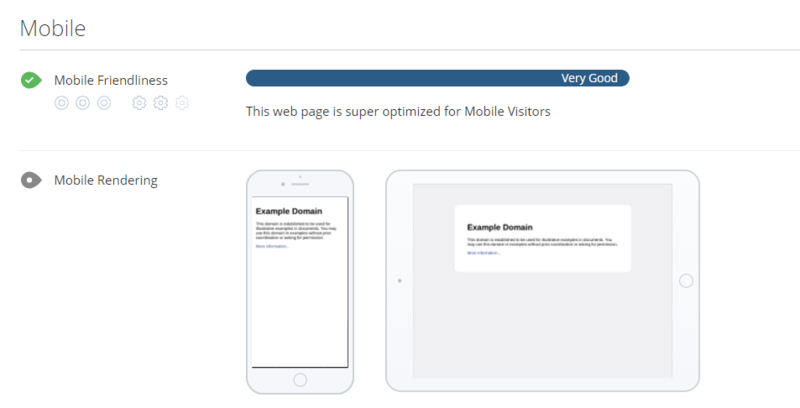 WooRank provides an excellent overview of your mobile site. Here you can check to see how your site renders across devices and more importantly, how quick and user-friendly it is. Check to see if your content is compatible across touchscreens. More specifically are important buttons and call to actions (CTAs) large enough to be touched without the need to pinch and zoom. It’s a well-known fact that web users are an impatient bunch. If your site takes more than 2 seconds to load almost half of your users will abandon your site. Mobile users are even more impatient so you need to concentrate on improving your site’s speed. So it’s no mystery why speed will a massive impact on your SEO. Compression: Compression reduces the size of a file and can help reduce load time by up to 90%, and all modern browsers are able to handle gzip compression. Learn how to enable gzip on your server here. 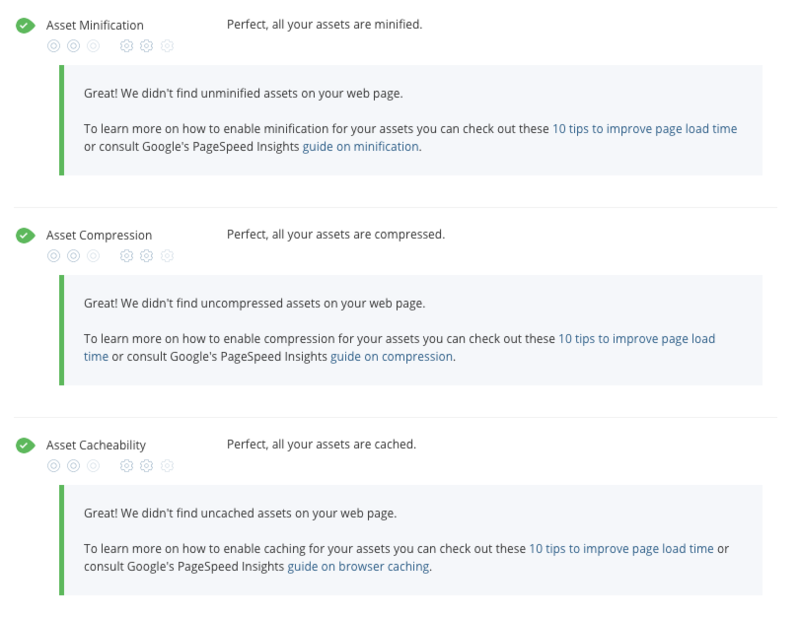 Caching: Uncached files have to be downloaded every time a user visits a page, which is a major drag on speed. Use Cache-Control headers to define how long a browser should cache a particular asset. Image Optimization: Google recommends using lossy compression for images because you can get away with losing some data without having much of an impact on how we interpret the image. It’s also possible you used HTML to resize the image on your page, instead of changing the file size. This can cause reduced load time due to large file size. An ecommerce site will only ever be as good as its ability to convert and slow pages don’t convert. If your business only exists online then conversion is everything. One of the most crucial aspects of an ecommerce SEO audit is ensuring your site is fully secure. If you want people to buy from your site they need to be reassured that your site is trustworthy and safe. For a while now Google has been calling out all non HTTPS (SSL secure) sites as being ‘Not secure’ in the browser bar, which will look something like this. On top of this, Google gives a slight boost to URLs that use HTTPS. Couple this with the fact that users will be deterred from buying anything from a non-secure site and you can see why we’re emphasizing this point. If you’re not sure if your domain is secure, check with a WooRank review and follow this guide on how to migrate your site. However, migrating your pages to HTTPS isn’t enough. You must ensure that all of your images, scripts and video are also on HTTPS URLs. Use an SEO crawler to uncover any instances of less-than-secure pages. It’s no secret that quality backlinks are integral to SEO. With as much focus on quality as you can get. Therefore, your SEO audit must also focus on determining not only the number of backlinks but the quality of each of those backlinks. Many ecommerce sites suffer from duplicate content issues caused by their ecommerce platform. If your site allows users to filter products by category, item types, color, etc. it’s likely your site will show duplicate content. 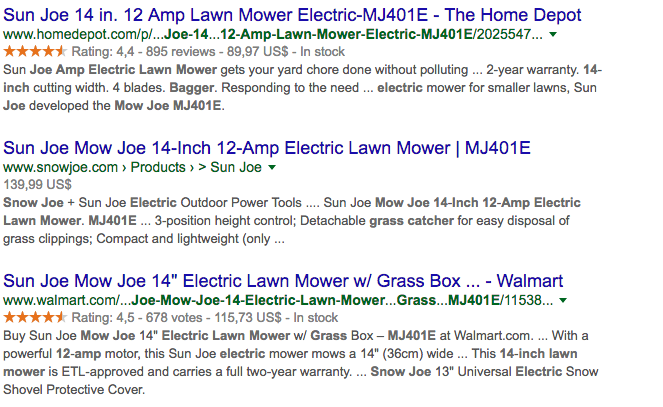 For every instance that a product appears Google will class this as duplicate content. To get around this you should be using canonical tags which tell search engines which bits of content are the original and which bits to ignore. However, with an ecommerce site, you’ve likely got way too many pages to check this yourself. Use an SEO crawler to check through all of your pages to make sure canonical tags have been implemented correctly. Your crawl results will also help you find instances of broken links hidden deep in your internal pages as well as pages that return HTTP error codes. Too many of either of these errors can lead to Google booting your pages from its index. Online sales topped $341 billion in the United States in 2015, more than a third of all retail sales that year and a 14.6% increase from 2014. Making it the sixth straight year of double-digit growth for ecommerce revenue. That’s a pretty substantial pie. However, with at least 110,000 ecommerce companies in 2014, the competition can get pretty fierce. If you’re an ecommerce company either looking to boost your sales, or just getting started, you need to start by turning your attention to organic search traffic and SEO. Why does SEO matter for eCommerce? 44% of people begin shopping with an online search. Almost a third of ecommerce traffic comes from search engine results pages. 26% of online purchases come from organic search traffic. The top-ranked page in Google SERPs get 32.5% of search traffic, almost double the share that goes to the second-ranked page. The top five pages get 75% of the traffic. The top 10 get 90%. To put that in terms of dollars and cents, search engine traffic has a hand in about $150 billion in revenue and millions of unique users (82 million monthly users for Amazon alone). So if you want to compete you need to rank, and rank highly. Keyword research is a foundational step of on page SEO. If your goal is to rank highly in search results, you need to know what your potential customers are looking for and then build your site to include those keywords. For ecommerce sites, your keyword research will also influence how you build your site architecture and URLs. So you really do need to take this step seriously. The first step of keyword research is coming up with a seed list of keywords. When starting this step look to your category and product pages. Think of them as landing pages for your visitors - generally speaking, the majority of your traffic and conversions will come through these pages. Then ask yourself, what search terms would you use to find products in those categories (or subcategories)? Don’t stick to just the basic one-word searches - think of longtail keywords with up to four or five words to make sure you’re targeting in-market searchers. After you’ve brainstormed a solid list of keywords it’s time to expand it. There are lots of keyword research tools out there that will help you come up with an expanded list of keywords by appending every letter of the alphabet to your keyword and scraping Google’s suggested keywords. This will help you find keywords that more accurately reflect what your potential customers are searching for. There are other tools you can use to find related keywords straight from the source: search engines. 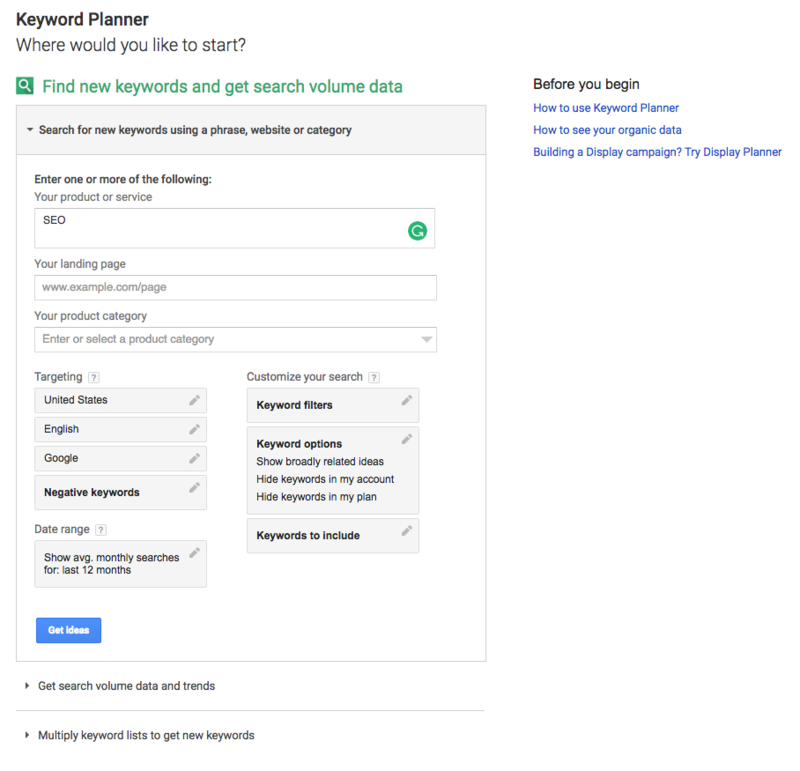 Part of Google’s AdWords paid platform, Keyword Planner was originally built to help advertisers do keyword research for their paid campaigns (don’t worry - it’s free to sign up and use). However, it’s also a great tool for organic keyword research. It can provide you with information regarding keywords’ popularity and competitiveness on Google. Once you’ve got an AdWords account, Keyword Planner is available in the Tools tabs at the top of the page. You can use the search for new keywords to find a list of relevant keywords and identify monthly search volume. If you’ve got a CSV of keywords from a tool like Ubersuggest, upload them under ‘Get search volume data and trends’ to find their average monthly searches, competition and suggested bid. 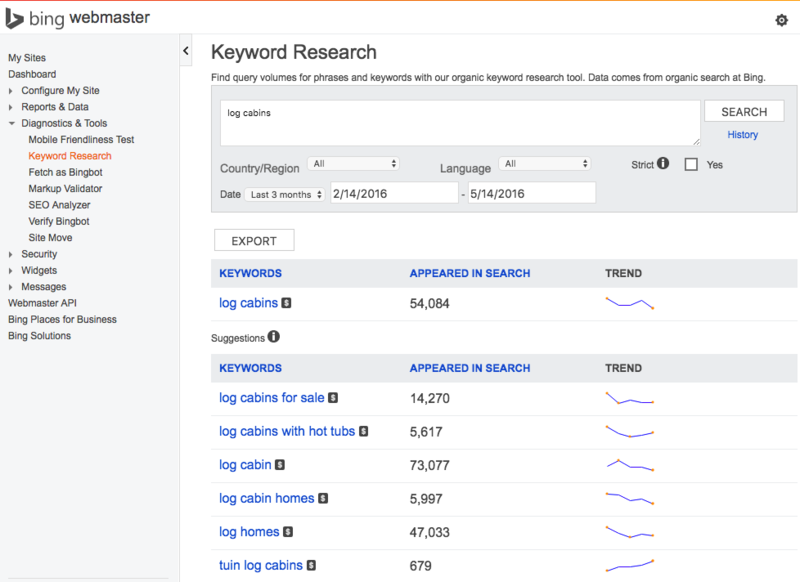 It’s worth noting that while Keyword Tool’s competitiveness and suggested bids are AdWords-specific metrics, you can still use them to extrapolate organic search data. Keywords are highly competitive and have high bids because they generally demonstrate searchers’ commercial intent - there’s money to be made from them. So you can usually correlate highly competitive keywords to suggested bids to keywords that in-market people are searching for. Be careful, though, avoid targeting over competitive keywords; if they’re too general you’ll struggle to rank against the big players in your industry and wind up with high bounce rates and low conversion rates. The Keyword Planner tool is also a good opportunity to come up with some latent semantic index (LSI) keywords. LSI keywords are words or phrases that are synonyms or topically relevant to your keyword. 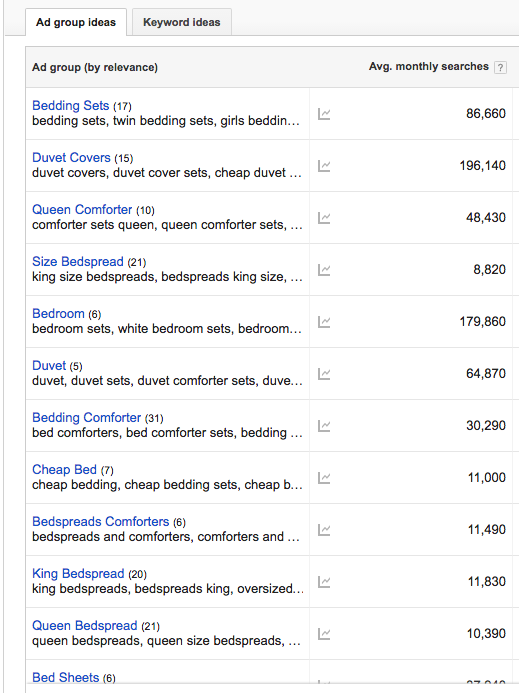 For example if your keyword is [bedspreads], your LSI keywords could be [bedding] or [duvet cover]. Search Keyword Planner’s Keyword ideas and Ad group ideas to find inspiration for LSI keywords. Bing Webmaster Tool’s Keyword Research feature works in much the same way as Google’s Keyword Planner. After you enter a keyword and select a region and language, Bing will come back with up to six months’ worth of search volume and historical trends. It will also generate a list of related keywords. Use the Search Keywords section under Reports & Data to find what keywords are currently bringing traffic to your site. See how you’re performing for your targeted keywords and maybe uncover any that you didn’t realize you were ranking for. 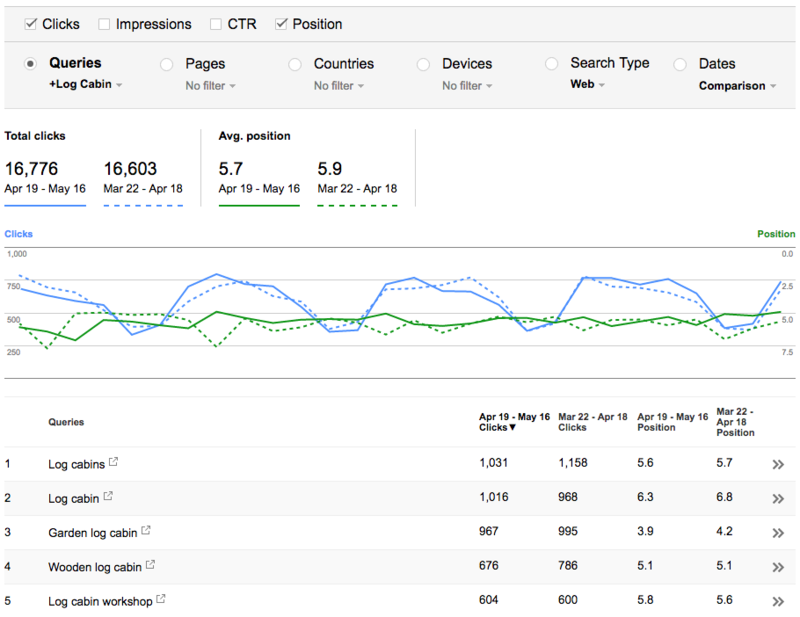 This report includes clicks, impressions, click through rate (CTR), average position in Bing and average click position. 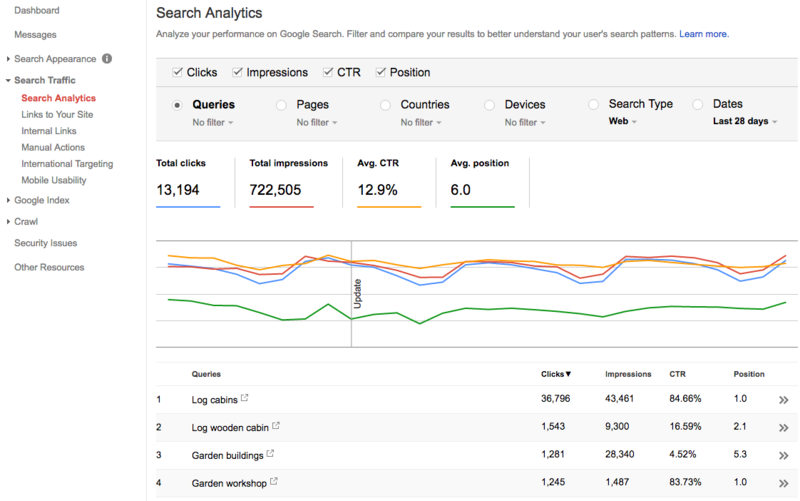 Find your Search Analytics report in Google Search Console under Search Traffic. Like Bing Search Keywords, Search Analytics lets you find which keywords brought traffic to your site in the previous 90 days and includes clicks, impressions, CTR and average search position. Search Console, though, let’s you slice and dice your data to make it even more useful. You can filter the report to see which keywords drive the most traffic to a category page or what your most popular mobile keywords are. So now that you’ve got a list of keywords it’s time to put them into your product and category pages. A well-optimized ecommerce page includes three main elements: the title tag, meta description and page content. Title tags are a bit of HTML used by browsers in tab titles and bookmark descriptions, by social media sites when displaying links posted by users and by search engines when displaying search snippets. They are also one of the most important elements of on page SEO; include your page’s most important keyword here. Search engines rely heavily on title tags to tell them what the content on the page is about and therefore the relevance of the page to a searched keyword. Meta descriptions used to be important for your SEO, but Google doesn’t directly rely on them much anymore. However that doesn’t mean they aren’t important for your SEO. A signal search engines do rely on is CTR, and meta descriptions can play an integral part in maximizing clicks. Best prices on _____ today. Get X% off _____ now. Buy _______ and get FREE shipping today. Click here to get the best _______ at the lowest prices. Looking for men’s dress shoes? Get top brand Oxfords, monks, derbies and loafers with FREE shipping! Click here to find the best deals on all styles & colors. Creating content for your category and product pages can represent a challenge for your SEO efforts. How do you write quality content that not only attracts organic search traffic, but also converts it into sales? First of all, you need to create longer, in-depth content. 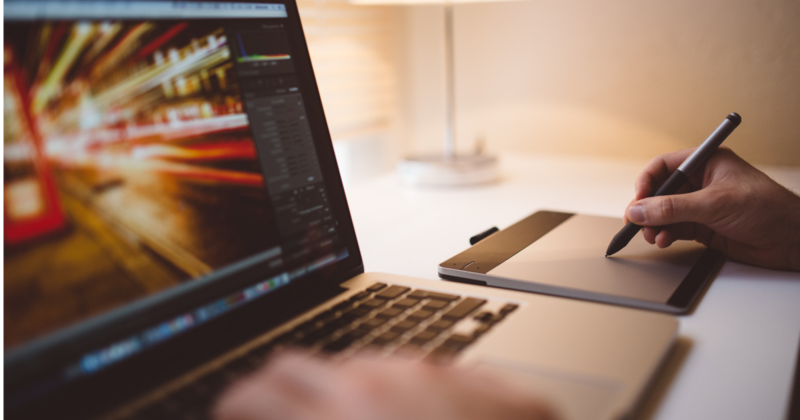 The average first page result has almost 2,000 words per page. Obviously that’s a lot to expect for every product page and runs the risk of some serious reader fatigue. Set your sights on at least 1,000 words per page. That probably still sounds like a huge number but you’ll get there easier than you think. The first piece of content you should start with is the product description. It’s absolutely vital that you don’t just copy and paste the manufacturer’s product description. If you do this, you’ll end up publishing duplicate content and won’t even make it onto the SERPs. When writing your description keep your target keyword list handy. Mention your primary keyword three to five times throughout the description. You don’t need to worry about how densely the keyword is used, just using it a few times (3-5 is ideal) will tell the search engine what the page is about. This is also a great place to include a few of the LSI keywords you came up with earlier. Take the time to think about how many different versions of this page you’ve created. Depending on your platform you could have unique URLs for different product versions such as color, size or material, each displaying the same product description and/or reviews. If you find yourself in this situation, start by consolidating the different versions onto a single page with the different options listed on the page or in a drop down menu. Use 301 redirects and the rel="canonical” tag to automatically reroute traffic and link juice to the consolidated product page. If your ecommerce platform doesn’t let you do this, consider switching to one that does, like Shopify or Magento. Ideally, after you’ve written your product description you’ll only need a few hundred more words to reach that 1,000-word threshold. That’s where product reviews come in. Amazon’s guidelines for customer reviews puts the ideal length at 75 to 100 words per review. So once you’ve got four or five reviews you’ll be approaching the ideal length of quality, on-topic content to appear in Google’s first page results. Product reviews bring the added bonus of boosting your conversions: adding just one customer review boosts sales by 10%. They’ll also keep your page "alive," which encourages search engines to crawl your page more often and provides an overall SEO lift. There’s no guarantee Google or Bing will include your structured data, but they can’t if you don’t include it. For more help on adding structured data markup to your page check out Google’s Structured Data Markup Helper. Use Google Search Console’s Structured Data area under Search Appearance to make sure the search engine can find your Schema.org makeup. At the end of the day, everything you do to your site comes down to one thing: driving sales. As we established in the beginning of this piece, if you’re an ecommerce site, a large portion of your sales are starting off as organic search engine traffic. But in order to take advantages of the benefits organic traffic has to offer, you need to focus on your SEO. Remember: Search engine optimization isn’t an overnight process. Nor is it a set and forget it deal. Search engines, and your competitors, are constantly making changes that you’ll need to stay on top of to keep your strategy up to date. However, with the right on page adjustments and content optimizations you’ll find that your efforts can more than pay off with an increase in qualified, targeted traffic that converts into sales and revenue. If you haven’t audited your site yet, or it’s been awhile since your last audit, do it for free with WooRank. You’ll be able to review all of the criteria discussed above — and more!